Insomnia, one of the most prevalent sleep disorders, affects between 30-50 percent of the population at some point during their lives. Ten percent of those people suffers from chronic insomnia. Serious health concerns have been linked to a lack of sleep, and insomnia can impact long-term physical and emotional health. When someone has insomnia, it means they are unable to fall asleep, stay asleep, or both. People who wake up on a consistent basis a few hours early each day and can’t get back to sleep are also considered to have insomnia. People of all ages from children to seniors suffer from insomnia, although research shows 40 to 60 percent of those are over 60 years old. More women than men suffer from insomnia. People with chronic insomnia are at higher risk of serious health problems including heart disease, high blood pressure, stroke, diabetes and depression. They also have a higher tendency to become substance abusers. Fatigue is responsible for many thousands of traffic accidents each year. 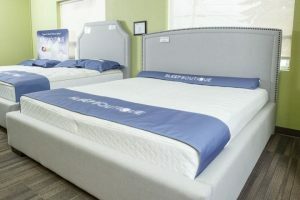 Although Sleep Boutique doesn’t claim to be able to cure insomnia, we do offer mattresses that are built to suit you, which can make it easier to sleep better.